Yesterday I was part of a US Green Building Council group that went to Austin to encourage our legislators to vote for several “green” bills pending before the House and Senate. While there, I learned several interesting things. One lady named Angela that I met at a USGBC reception at Austin’s famous Scholz Garden is helping farmers and ranchers get wind turbines. It all started from dating a Dutch guy (he left but the business idea stayed). Angela said that the Midwest is converting rapidly to manufacturing wind turbines – and the plants are spreading south. Even the old Maytag plant in Iowa is now making wind turbines (which means even fewer people will be calling the lonely Maytag repairman). These are the new “green” jobs of our future. She said that wind farms were going up all over the Midwest and spreading south. They usually build a plant near the wind farm. Then they keep the plant open making parts for other wind turbines so it provides a source of permanent employment in a new “green” industry. Farmers and ranchers have a lot of energy needs to run their operations. She said some existing turbines are too big and others too small for this market. She is seeking turbines that are “just right,” about 44 KW. They don’t yet exist but she thinks they will in two years. The mood in the Austin legislature is different from when they last met two years ago when energy efficiency bills went nowhere. Now the legislature is almost evenly split between Democrats and Republicans and the feeling is that some kind of energy efficiency bill will be passed with bipartisan support. There is a bill for green schools and another to require future State buildings be built green. However, there has been some misinformation on the cost of building green and Texas Senators Dan Patrick and Joan Huffman voted against SB16. Most cost estimates for building a LEED building are that it will add less than .1% to 2% to the initial construction costs. The payoff is in the drastically reduced operating costs of a green building – up to 60% less electricity, water usage, etc. That makes LEED buildings more attractive to tenants and investors. The lower operating costs will recover the extra construction costs within a few months –and will continue delivering the owners lower operating costs for decades of the building’s life. LEED buildings also command higher sales prices and rental fees. Studies show that students score up to 20% higher and have fewer sick days when they are in a LEED building (which allows more light in) and employee productivity is higher in LEED buildings. On average, green schools save $100,000 per year, enough to hire two new teachers, buy 200 new computers or purchase 5,000 new textbooks, according to the report “Greening America’s Schools: Costs & Benefits” by Gregory Kats of Capital E, a national clean energy technology and green building firm. However, few schools are being built “green” because contractors used by trustees don’t want to change their ways. The only way to change this is to get the public telling their school boards –and legislators-- that they want “green” schools and more energy efficient buildings. Students are the next generation. They need to know about the latest technology and LEED’s uplift on student’s scores. If you want success in creating new jobs and importing less foreign oil, then encourage your legislators to vote “green.” The bottom line is that green building is making us more energy efficient, cutting costs and creating green jobs to take the place of old manufacturing jobs lost. Yesterday I visited a friend who is at MD Anderson with skin cancer. He's fighting for his life. Cancer cells from a melanoma have migrated into his bones. He was a frequent sailor enjoying boat races in retirement. At about the same time I got an email from our manufacturer stating that our safety film has been awarded The Skin Cancer Foundation Seal of Recommendation -- just in time for Skin Cancer Awareness month in May. That makes our window film the perfect solution for effective UV protection. As well as cutting solar heat and providing storm protection, it also screens out 99% of the UV rays that cause skin cancer (and fading of your furnishings). Many consumers think of sun damage only when they’re in the yard, on a boat or at the beach. We have to change how people think about skin cancer by educating them on how harmful sun exposure is – whether it’s at the beach, in the car, at work, or at home. The only place our product won't protect you is in a tanning bed--which increases the UV ten times more than the stuff you get from the sun...if used too much tanning beds are a form of (skin cancer) suicide. I also got calls from people in Bangladesh, Maylasia and Turkey who are interested in our products! For some reason blogger took my English "The Pakistan Threat" and converted it into some kind of (Hindi?) language or gibberish. It's never done that before. It's a strange sign at a strange time. The Taliban are taking over more and more of Pakistan, the only Islamic country with nuclear missiles. The Pakistani government seems to be losing control. That could mean the same crazy extremists who backed Al Qaida's run-up to 9/11 could be running a country with transportable nuclear weapons. Iran is a wanna be nuclear power. Pakistan IS a nuclear power. Having people like Osama bin laden controlling it is not a good thing for anybody. That means people here need to think security, security, security. Aside from what can be done on an international scale in Pakistan (probably not much when you have a weak President like Zardari--he's no Benazir Bhutto), people here need to be double preparing: for both very real Hurricane threats, and very real blast threats. Armor Glass International, Inc. is a co-sponsor of the green technologies on display at Houston's first-ever Green Resource center. Houston Mayor Bill White is coming tonight and deserves credit for this visionary effort that will educate the public on green technologies. Come! It's tonight at 5 - 7 pm at 3300 Main, Houston. Be our guest. You can see the latest green technologies to save energy and money. Armor Glass has demonstration 8 mil hurricane security/energy-saving solar film on display at the GBRC (it shares a window with 3M 2 mil solar-only film). Sorry for the late notice but we didn't get the approval to install our life/property/energy-saving film until Monday (two days ago). People have been complaining that everyone but the regular folks are getting a bailout – while overlooking a valuable new tax break for the ordinary Jane and Joe’s like you and me. It also fits in with Earth Day. It was included in the American Recovery Act of 2009. It is a 30% tax credit up to $1,500 for the cost of qualifying products installed in 2009 that increase energy efficiency. As you know, a tax credit is better than a deduction because it cuts taxes owed dollar-for-dollar. Houses lose most of their energy due to roofs and windows. Sun penetrates both. A simple silver spray on an attic can form a radiant barrier and substantially cut attic heat and loss of energy though the roof. According to the Department of Energy, as much as 60% of your house energy is lost through the windows, which are the weakest link and are easily breached by humans or storms. There is a solution. Solar Security window film does three things: (1) it cuts up to 70% of the solar heat coming through your windows, (2) provides protection from window breach by Hurricane and tornado wind-borne debris, hail, golf balls, burglars, etc. and (3) qualifies for a 30% tax credit up to $1,500 depending on the frames and windows. It also cuts cancer-causing, furnishing fading UV rays by 99%. Radiant barriers are equally important. Each technology cuts the owner’s electricity costs, making it a win-win. The right window film can cut power bills up to 30%. Anybody with a primary home gets the tax credit. What is there not to like about that? So don’t listen to the whiners who say the Congress didn’t do anything for the little guy (yes, this bill received zero votes from the GOP Reps, but they still get the tax credit if they buy the products). If your morals requiring passing on the tax credit for ordinary people like us, you can ignore it. And you can continue paying more money to your power company if you so desire. I do not so desire. The less energy I use the more money I save and put in my pocket and the less oil we have to import or coal we have to burn. The more we all save in energy costs the better off we are. My only suggestion for improvement is the tax credits apply to ANY film that cuts solar heating over 50% or more and forget about the type of window frame and whether it is a single or double pane. Who cares what kind of window it is as long as the product cuts the solar heat, right? People need solar relief and a cost break. It should also apply to all solar security films since they cut property losses from storms. I like the security of not having to worry about the tornado and 60-mph winds breaching bare windows, like those that hit us in Seabrook over the weekend, or the next Hurricane IKE or hail storm. Who wants flying glass and rain pouring in? So Congress DID pass a bill that gives a tax credit to every Joe and Jane Doe who has a primary residence and upgrades its energy efficiency (the bill received ZERO GOP House votes, FYI. If your morals or philosophy opposes this tax credit as a ‘bailout,’ no one will make you take it or cut your energy bills). But don’t take my word for it. Google the energy efficiency section of the American Recovery & Reinvestment Act of 2009 and check out the tax credit for your own benefit. Then look for vendors in your area with radiant barriers and solar films and similar green products that will save you money and/or protect you, your property, your children and your pets. I saw many companies doing just that at the Houston Green Expo this weekend. My company was one of them. We are creating the green jobs of today and tomorrow that will take our economy to a new level and a sustainable future. We already have a huge backlog of business and will need months to catch up, so this is not about us. It’s about a trend toward green jobs and green tech. Congress is finally helping make it happen. It feels GREAT to be in a GREEN business that both saves energy and protects people. Yesterday went from wild to worse - a great flood. When I finally got out of the Green Expo to go home, rain had been pouring all day and water had flooded the frontage roads on I-45. I saw rows of stranded cars. A lady was standing next to the freeway with an umbrella, looking down at the scene. Motorists lined the side of the freeway, just sitting there. Some were stuck in the grass as they tried to cross a 10 - 15 grassy area to get from frontage road to freeway - only to get stuck. It was a huge mess. the freeway wasn't moving. I thought it was due to a wreck. It was due to people rubber-necking the folks who were stuck on the frontage road. Grrrrrrr. Can't look and drive? Apparently not. After that scene the freeway started moving again. I got lucky. The warning signs said "Frontage roads flooded." So I stayed on the freeway - and Clear Lake Blvd (my exit) was the first exit that was not under water. Ellington exit was filled with dead cars. A big truck pulling a trailer was throwing up a 10 foot high wake trying to get through it. Winds near the coast were sideways - spraying water on my condo windows which are protected by both our Armor Glass hurricane film but also by a 10 foot roof over the balcony. Even the roof cover was not enough. Fortunately, I didn't have to worry about a window breach. Our expo had quite a few people despite the nasty weather. A ton of kids started the day and that was fun. It will be a nice day today. Thank God. For the weather and the fact that my friend Wanda's cancer surgery on Friday was successful. Things are looking up. I left the Green Expo last night at Reliant - and ran right into a wall of water. It DUMPED all the way back to shores of Clear Lake. This morning Houston forecasts 14 mph winds. Not here - the winds are WILD. Over 30. It makes me realize how important it is to have protection on my windows. The Woodlands got hail last night. That happened in Austin a couple weeks ago, knocking out windows. The next two days I'll be back at Reliant. Come out and check out the electric cars and energy saving technologies. It's going to be a rain day, perfect for browsing inside. Under the American Recovery and Reinvestment Act of 2009 (which our Rep. Pete Olson R-Sugar Land voted 'no') you can get a tax credit of 30% of the cost of energy-saving window film up to $1,500 for installations done in 2009 of a primary residence. Our hurricane film is included. Why put on solar film that provides ZERO security when you can get a tax credit, save energy AND get hurricane/explosion protection for your windows under this law. It applies to installations made in 2009. Hurricane season starts June 1. Check out the American Recovery and Reinvestment Act of 2009 - and in the future vote for representatives that make these types of win-win energy-saving incentives possible. It will protect people, cut costs from storms, cut energy use and make us less dependent on foreign oil. What is wrong with that? Radar shows a huge storm is moving into the Houston area this morning. The system goes all the way north of Oklahoma, so we are the bottom end of millions of people who are about to get socked by high winds, some hail and rain on this Easter Sunday. It's now on top of Austin and San Antonio - which need the rain but not the hail. The Somalia saga of the captured American Captain is ongoing. It shows how our military is not built to deal with this new age of small actors doing great harm, like pirates in small boats taking over huge ships on a non-stop basis. it's embarrassing to see a row of huge ships anchored off a small county that has had no government for 18 years. Therefor it has no police or coast guard. It is a tribal society in which people are trying to eat. Did you expect them to do nothing? The best recommendation I saw was this article. Navy Commander James Kraska and Navy Capt. Brian S. Wilson make this common sense recommendation -- provide small fast boats and local police forces in Somalia, saying that it would be more effective in stopping hijackings than a huge destroyer. Someone should put these guys at the top in the Pentagon. Having smaller, faster ships able to deal with small boats -- and speed along as fast or faster than WWII PT boats -- make more sense than sending an elephant to try to stomp flies. We need to develop fly swatters --local people who know the pirates and tribes and can be provided with the equipment to intercept them from Somalia, instead of having big, expensive navy ships wandering around, too slow to cover the millions of square miles of ocean and unable to deal with a few pirates holding a hostage in a lifeboat. If we don't get smarter, a bigger disaster will happen. These failed states are perfect places for any terrorist to hide, or plot. We ignore it at our peril, just like we ignored Afghanistan until 9/11. There is another technology we need for our own good right here in America - high speed rail. Japan and Europe have 200+ mph rail systems. Our best Amtrak is limited to 84 mph. Texas is considering high speed rail connecting the big three - Houston, Dallas and San Antonio-Austin. It would create jobs in both construction and future operations, advance our technology and make our transportation more efficient. It would also provide an alternative to flying and driving, especially when the weather is bad or you have a lot of ground to cover. My suggestion is that we should skip a generation of technology and move straight to Mag Lev - so that we could be traveling over 300 mph without steel touching steel. I have been on high speed steel systems and it requires a perfect track connection to avoid a derailment. A Mag Lev system would be safer. A steel-on-steel track could become warped in the heat or if maintenance lags, potential for a derailment. A Mag Lev system would also have a bigger technology payoff for us than a traditional steel-on-rail system. China already has one at Shanghai. Where is ours? It's time to update our technology worldwide to provide effective solutions to our security and transportation needs. 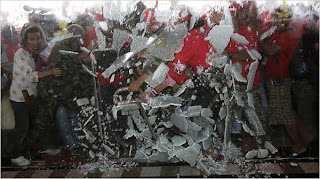 This is a photo of a glass door being shattered by protesters at a convention center in Thailand. They had to cancel a major summit as a result. After the protesters broke in, they caused even more damage inside. The breach would have been avoided if the owners had installed our security window film with frame attachment. Protesting is a right, but breaking into property is not. But mobs do funny things. Any building's security should include the obvious - a cost effective defense for when someone or something attempts to break through the the weakest link of any building: its windows. Sooner or later, mother nature or people will hurl debris at it. I am amazed that millions of dollars are lavished on these glass palaces that have spent a fraction of that -- not even one dime -- on protection from someone pushing a shopping cart through a window in anger. Or hurling a brick through it to steal. So the list grows of the sheer number of applications for our Armor Glass products that would protect both property and people. It would also keep conventioneers from being exposed to 99% of the UV rays that cause serious skin cancers, and would cut energy use. That's a lot of bang for the buck. Austin Legislature is "Green" this year - Bluebonnets are Out! Yesterday I was in Austin (1) covering the national hurricane convention and (2) speaking on behalf of our company in favor of the Green School bill HB3149. Good news. The wildflowers are out and looked great. And there appears to be a lot of momentum in this legislature to pass some green legislation. I was impressed with the subcommittee holding hearings on HB 3149. They had ZERO negative comments and only one neutral. The rest were positive. Being against green anyway these days is akin to being against God, Mom and Apple Pie. And for good reason. The less energy we use the better off our pocketbooks will be. Bluebonnets are great but saving money on utilities that all of us have to pay is even better. My comments to the committee were focused on getting a "2-fer" - both energy savings AND security -- from explosions, hurricane-force winds, vandals and even hail. Another problem: Schools are used as emergency shelters but how can you "Shelter in Place" with glass flying all over the place from a wind-borne debris strike? I discovered that Austin had a big hail storm a few weeks ago that took out windows left and right in the section of town it hit. We have a considerable backlog of buildings to do already. And more in the pipeline. Hurricane season starts June 1. Few are prepared.